There’s a very special place on the Outer Banks of North Carolina called Springer’s Point. Located on the island of Ocracoke, it’s one of the area’s best kept secrets, and is situated on the shore of Pamlico Sound near Ocracoke Inlet. Legend has it that Blackbeard the pirate hung out there. 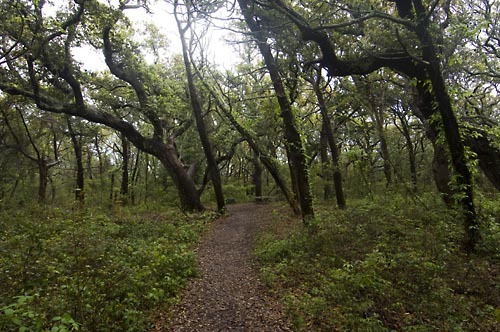 It’s also a prime example of a maritime forest…. almost magical. One of the previous owners was a wealthy industrialist named Sam Jones. He loved it so much that he’s buried there with his horse, Ike. The property was passed to his heirs, and eventually bought by developers who planned to build condominiums. 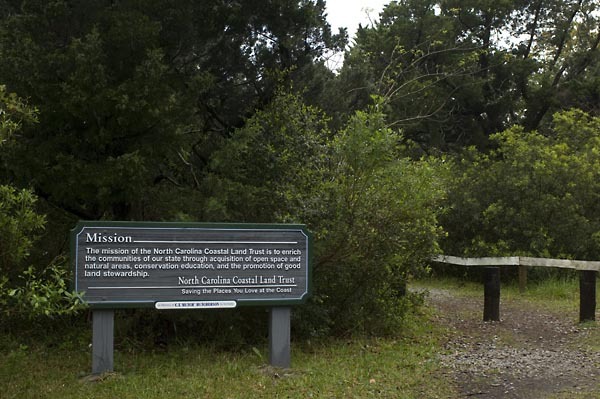 Then the North Carolina Coastal Land Trust stepped in, negotiated and purchased it for preservation. Initially they saved 30 acres, then an additional 90. Since our natural coastal areas are rapidly disappearing, this is truly a great success story. One of my motivations to photograph Springer’s Point is to support the North Carolina Coast Land Trust in their mission of preservation through stewardship. 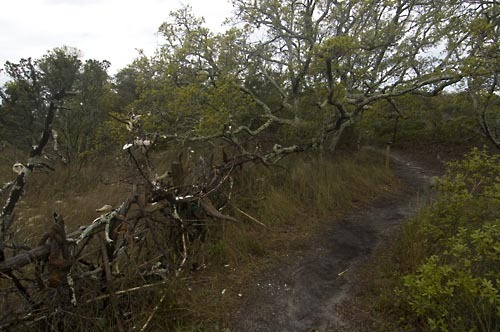 A nature trail winds through a variety of maritime vegetation. Grasses, wildflowers, shrubs and trees are designed to survive in this sometimes calm, sometimes hostile ocean environment. One can envision how the forest is shaped by the wind. I always enjoy the feeling of walking under the canopy of live oak trees and cedars. Near the end of the trail is my favorite live oak tree. It may have even been there as Blackbeard sailed the nearby waters hundreds of years ago. My favorite plant though, is actually one of the smallest. It’s called the Georgia Sunrose. I learned about it one day while walking the trail with botanist Richard LeBlond, otherwise I might not notice this beautiful and rare wildflower. 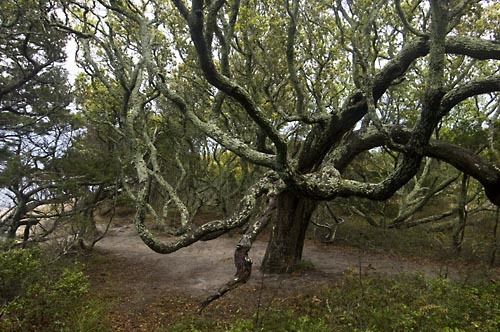 Native to North Carolina, the only place on the Outer Banks that it’s known to exist is at Springer’s Point. For some weeks in the Spring of 2007, I made periodic visits to Ocracoke. I could see the new growth sprouting from the ground, the leaves forming and then the buds beginning to set. In order to photograph the Sunrose, I needed permission to access a restricted area. Then I was able to spend time waiting for the best conditions. The Georgia Sunrose grows on a little hill of sand in an opening in the middle of the forest. Growing only inches off the ground, I photographed on my hands and knees, with my camera on a ball head, mounted on a tiny square of plywood. Composing shots was awkward. I framed one bloom only to watch a petal fall off. Several seconds later another one fell, then another and another until all five were gone. The timing seemed very precise all in a clockwise rotation. I felt as though I had witnessed a miracle of nature. 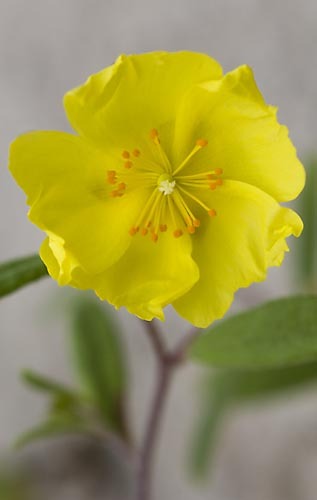 In full bloom, the Georgia Sunrose is about the size of a penny, and is short-lived, perhaps only a day. This entry was posted in Land, vegetation on December 4, 2008 by j0jgvm89bj.